We specialize in custom and personalized leather photo albums, photography portfolios, leather guest books, photo evelopes, leather wine totes, and leather presentation portfolios designed for specific purposes. Each custom leather product that leaves our doors is crafted on a per customer basis, and tailored to satisfy the specific needs of an individual customer. Whether it's a personalized leather guest book with custom guest book pages, a leather sales portfolio with your logo and a document sleeve, a photo guest book, yacht guest book, hunting photo album, military photo album, military guest book, funeral guest book, personalized wine tote, or a classic leather family photo album .... we can help. If you are seeking something truly unique please feel free to browse our website and contact us to discuss how we might handcraft a specialized leather product to accommodate your needs. 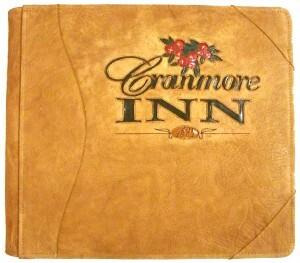 Give your mountain hideaway a special touch with a beautiful leather cabin guest book from Powell Leather. Are you looking for a leather guest book that will reflect the personality of your ski cabin, vacation home, lakehouse, or beach house? Whatever your need may be, we'll be happy to craft a special leather guest register that will blend beautifully with your special getaway's unique character. All Powell guest books are designed and crafted on a per customer basis. We'll be happy to discuss whatever your needs may be, then help you to develop a design to accommodate your purpose. Your book may be constructed from any combination of leathers that you like, and the cover may be personalized with any image, name, or logo that you choose. Standard guest pages come with all guest books, but custom guest book page layouts are also available. We will be happy to create a guest book page with whatever title, art or image, headers, and layout that you like. We will take your request, and our graphic designer will work with you to develop the ideal layout to satisfy your needs. Our guest books are easily adapted to become photo guest books, and some customers even choose to personalize a matching leather photo album to create a custom set. Please feel free to give us a call anytime to discuss what it is that you are seeking. We'll be happy work with you to help create something that will eventually become one of the most treasured and beautful fixtures of your special retreat. Returning from a Safari? Are you looking for a great photo album to use to display your photography? We've got an excellent way for you to preserve your memories from the big trip! We will craft a custom photo album for you with whatever sort of artwork you can imagine on the cover. All of our personalized leather portfolios are crafted from the best materials available to produce the highest quality books found anywhere. Your own custom artwork may be used on the cover. We've done loads of hunting albums, safari albums, vacation albums, and presentation albums for just about any purpose you may have in mind. 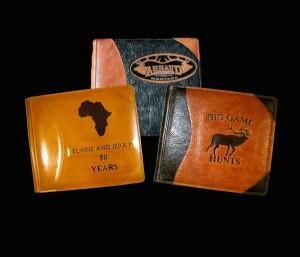 Give us a call to discuss how we might craft a beautiful custom Safari Photo Album for you. Are you looking for the perfect custom guest book, or personalized guest book for your home, ranch, business, or a special event? We will be happy to discuss your particular situation, and help you to create the perfect leather guest book for whatever it is that you have in mind. All of our books are crafted on a per customer basis from the best materials available to create a refillable personalized guest book that will offer years of service. Your book may be personalized from the cover to the interior pages. We can place whatever art you like on the cover of our books, and a create custom guest book page layout to convey the look that you want while collecting the information that you need. Photo guest book configurations are also available. Please feel free to browse our website to view our other great products like personalized photo albums, leather wine totes, presentation portfolios, leather photo envelopes, letter pad portfolios, and more! 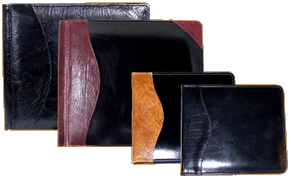 Custom leather photo albums, guest books, and portfolios aren’t all we make at Powell Leather. The PortAmore’ Wine Tote is the ultimate accessory for the wine enthusiast who enjoys a favorite vintage on the go. 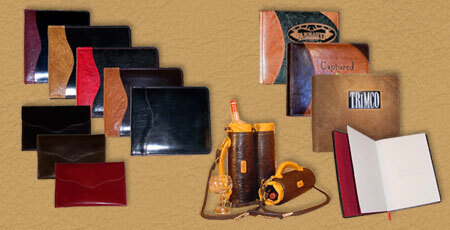 Our handmade leather wine totes are crafted in the same tradition as all Powell Leather products. 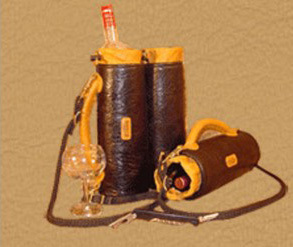 We only use the best materials available to create a leather wine carrier that is as durable as it is beautiful. Its two tubes accommodate a bottle of wine, a corkscrew, and two beautiful wine glasses which are included. The wine glasses may be removed from the lower tube in order to stow a second bottle if you like, in which case cocktail glasses may be stowed over the tops of the bottles. The tote is constructed from handsome European Shoulder Leather, and the interior is lined with 1/2" wetsuit neoprene material which insulates up to 4 hours, and offers shock protection for your precious cargo. The tubes have a soft leather closure which draws closed easily and securely. The PortAmore’ Leather Wine Tote is designed to give a lifetime of satisfying outings! Please be sure to visit our website and browse our selection of leather albums, leather portfolios, leather photo envelopes, leather guest books, leather letter pad portfolios, and other great Powell Products.